I. Am. LOVING! The gorgeous bold, vibrant color of Annie Sloan Chalk Paint in Greek Blue. It is such a lovely, clear blue, and a total knockout/standout color for any accent piece! When I bought the paint, I was told that it was very popular, but some people seem to have trouble with it. 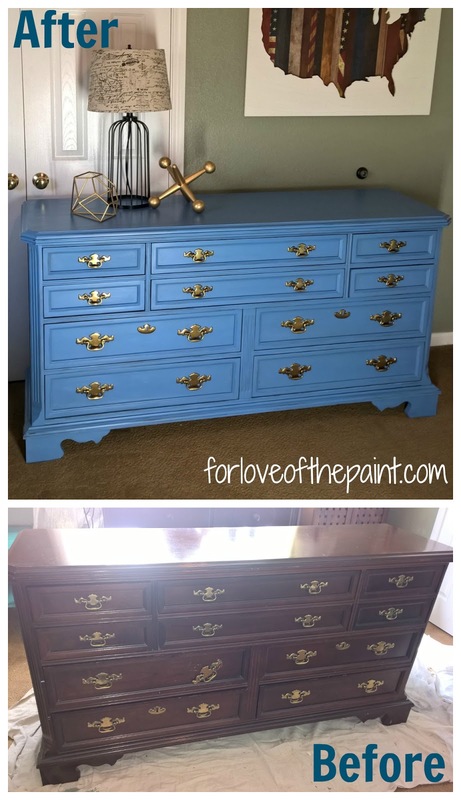 The only thing that I can seem to line up with this idea is that the paint looks a little lighter/whitish when you distress it, but by dusting off the surface and wiping with a damp, lint free cloth, the clear and gorgeous color returned to those areas. So just be sure to clean off all dust before you seal your piece! Doesn't the gold hardware seem even.. well, gold-er? ;) The updated color definitely makes the hardware stand out and appear more golden and radiant. Also, I frequently find that the hardware screws over time have difficulty holding the metal firmly in place, often when the wood has been worn back over time. Often you can put a washer between the head of the screw and the back of the drawer to help it find a solid grip! This can help prevent damage to the front of the wood surface as well. What are your favorite color palettes? Do you favor the classically chic neutrals, or love a bold color pop?